Orbital ATK’s Pegasus rocket finally launched on Thursday, carrying NASA’s CYGNSS environmental research satellite constellation into orbit. The air-launched rocket departed Cape Canaveral Air Force Station aboard its carrier aircraft ahead of its air-launch release at 08:37 Eastern time (13:37 UTC). 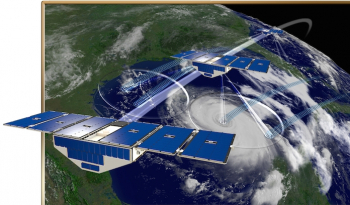 The Cyclone Global Navigation Satellite System – or CYGNSS – is a constellation of eight identical satellites intended to increase scientific understanding and improve forecasting of tropical cyclones such as hurricanes. The mission is a partnership between NASA, the University of Michigan and the Southwest Research Institute. The scientific payload aboard each CYGNSS satellite consists of a Delayed Doppler Mapping Instrument (DDMI), made up of a Global Positioning System (GPS) receiver, three L-band antennae equipped with low noise amplifiers and a processing unit, the Delay Mapping Receiver (DMR). Two of each spacecraft’s antennae will be Earth-facing to pick up GPS signals reflected and scattered by the ocean surface, while the third will be zenith-pointing, allowing the spacecraft to receive GPS signals directly to determine their own positions. By analyzing the way the ocean surface scatters signals from the GPS satellites, scientists hope to be able to determine wind conditions near the ocean surface. This technique is expected to yield data even when the surface is obscured by the clouds and precipitation of a storm. The use of an eight-satellite constellation will allow for more frequent observations, allowing for a better characterization of the early stages in a cyclone’s formation and of the storm’s eventual decay. Once in orbit, the satellites will be spaced evenly around their orbital plane, achieving an angular separation of around 45 degrees from each other. The CYGNSS satellites were built by the Southwest Research Institute and the University of Michigan, while their deployer was developed by Sierra Nevada Corporation. Each satellite has a mass of 28.9 kilograms (63.7 lb), with an overall payload mass of 345.6 kilograms (761.8 lb) including the deployer. The CYGNSS mission is expected to last a minimum of two years. CYGNSS is part of NASA’s Earth System Science Pathfinder program, a series of missions intended to use new technologies and techniques on rapidly-developed, low-cost missions to research the Earth’s environment. NASA states its investment in the CYGNSS mission at $157 million. The launch of CYGNSS was contracted to Orbital ATK, using a single Pegasus-XL rocket to deploy the eight satellites. First flown in April 1990, Pegasus is an air-launched three-stage all-solid rocket. 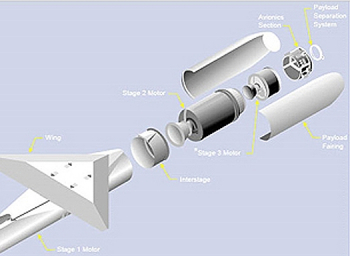 For the mission the Pegasus-XL configuration will be used, which uses stretched first and second stages to increase its payload capacity and a redesigned tail to allow launch from Orbital’s own carrier aircraft rather than relying on the use of a NASA B-52, which was also necessary due to the increased mass of the enlarged rocket. The launch of CYGNSS was the forty-third flight of Pegasus and the thirty-third of the Pegasus-XL configuration. These totals do not include three tests of NASA’s X-43A hypersonic research vehicle, which used a standard Pegasus first stage as a booster, and ground-launched rockets derived from the Pegasus family. The Pegasus-XL is one of three versions of the Pegasus; alongside the original standard Pegasus, and the Pegasus-H or Hybrid – which used the standard first and second stages, but with the tail modifications to allow launch from Orbital’s own carrier aircraft. The standard Pegasus made six flights between 1990 and 1994, while the Pegasus-H was used for four missions between 1995 and 2000. In its forty-two launches to date, Pegasus has achieved thirty-seven successful launches, with four failures and a partial failure. The most recent failure was a November 1996 launch with NASA’s High Energy Transient Experiment (HETE) satellite and Argentina’s SAC-B. The rocket reached its planned orbit, but due to an electrical issue neither spacecraft could achieve separation. Since then, Pegasus has achieved twenty-eight consecutive successes. Uniquely among operational rockets, Pegasus is designed to be air-launched. During early missions the rocket was dropped from under the wing of a NASA-operated Boeing B-52B Stratofortress. However, since 1994 Orbital has used a modified Lockheed L1011 TriStar – named Stargazer – instead. Stargazer, which first flew in February 1974, was owned and operated by Air Canada – aside from a brief lease to Sri Lankan carrier Air Lanka in 1982 – as a passenger airliner until its acquisition by Orbital Sciences Corporation in May 1992. The TriStar, a three-engine widebody aircraft developed by Lockheed in the 1960s as a smaller competitor to Boeing’s 747. Stargazer is one of a handful of the 250 TriStars built to remain airworthy worldwide and is believed to be the last example still flying in the United States. The name Stargazer was chosen as an in-joke making reference to Star Trek, where the ships which Captain Jean-Luc Picard and Commander William Riker served aboard before joining the Enterprise were respectively the USS Stargazer and the USS Pegasus. The CYGNSS satellites were integrated with the Pegasus-XL rocket at Vandenberg Air Force Base in California. The fully-assembled rocket was then mated to Stargazer for transport across the country to the launch site, a ferry flight which took place on 2 December. Pegasus attaches to the belly of the TriStar, from where it will be dropped at the climax of the launch attempt. Stargazer took off from the Skid Strip – Runway 13/31 – at the Cape Canaveral Air Force Station, about 65 minutes before Pegasus is scheduled to launch. 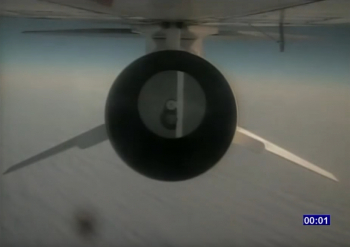 The aircraft flew out over the Atlantic Ocean to a predesignated drop corridor; following a flight pattern which was rehearsed as it arrived at the Cape at the end of its ferry flight. 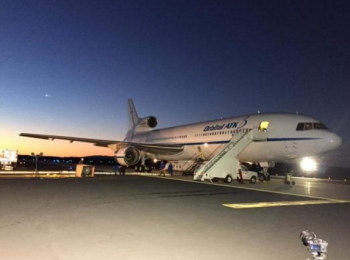 A NASA chase plane joined Stargazer and performed visual inspections of the aircraft and the Pegasus rocket prior to launch. Fifteen minutes before the scheduled launch time, Stargazer’s release mechanism were armed; three minutes later the rocket transferred to internal power and a test of the flight termination system was conducted. However, problems with the release mechanism power scrubbed the launch on Monday, relating to hydraulic pump that was suffering from power issues. The next attempt was called off due to a software issue specific to the satellites, prior to Thursday’s realigned launch date being confirmed. With all going well on Thursday, the count progress to about forty-five seconds before Pegasus was dropped, with its fin batteries activated. Tests of the rocket’s control surfaces and guidance system were conducted down to the twenty-second mark. Ten seconds ahead of deployment, Stargazer’s pilot gave final confirmation that everything was go for launch. Pegasus’ release from Stargazer occurred at the zero mark in the countdown, with the aircraft at an altitude of 12.4 kilometers (40,700 feet). The rocket fell away, before igniting its first stage Orion 50SXL motor five seconds later. Thirty-one seconds after ignition the rocket passed through the area of maximum dynamic pressure, Max-Q. The first stage burn lasted one minute and twelve seconds from ignition, and was followed by a sixteen second coast before stage separation. The spent first stage was jettisoned at an altitude of 70.5 kilometers (43.8 miles, 38.1 nautical miles), one second before the second stage ignited. 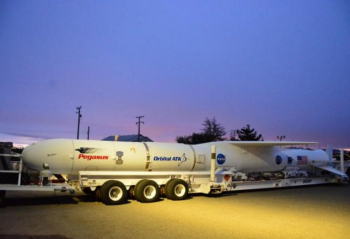 The second stage of the Pegasus-XL vehicle is an Orion 50XL solid rocket motor. This fired for seventy-four seconds, with separation of the vehicle’s payload fairing taking place thirty-eight seconds into the burn, with the rocket at an altitude of 115.9 kilometers (72.0 miles, 62.6 nautical miles). After the second stage burned out, the mission entered a longer coast phase as the rocket ascends towards the apogee of its trajectory. The second stage separated three minutes and 49 seconds after burnout, with third stage ignition eleven seconds later. Pegasus uses an Orion 38 as its third stage. Burning for 68 seconds, this provided the final kick necessary to place CYGNSS into orbit. Spacecraft separation began at twelve minutes and fifty-six seconds’ mission elapsed time; exactly five minutes after the end of powered flight. The CYGNSS satellites were released in pairs at thirty-second intervals, with CYGNSS-A and CYGNSS-C separating first. The second pair will consisted of spacecraft E and G, followed by F and H and finally B and D. The launch lasted fourteen minutes and twenty-six seconds from the rocket being dropped from Stargazer to the separation of the final two satellites. CYGNSS is expected to be deployed into a circular Low Earth Orbit, at an altitude of approximately 510 kilometers (317 miles, 275 nautical miles) and an inclination to the equator of 35 degrees. Following separation from Pegasus, initial contact will be established with the satellites after approximately three hours. On-orbit testing and commissioning is expected to take no more than sixty days, after which science operations will commence. The launch was the first flight of a Pegasus rocket since June 2013, when a Pegasus-XL flying from Vandenberg Air Force Base deployed NASA’s IRIS solar research satellite. 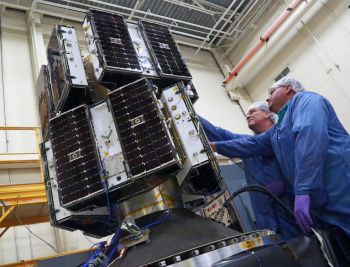 The rocket’s next flight is currently scheduled for mid-June with the ICON ionospheric research satellite; currently this is the only Pegasus launch remaining on Orbital ATK’s schedule. 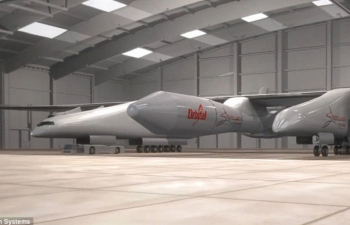 However, Orbital announced a partnership with StratoLaunch Systems to use the Pegasus-XL in conjunction with StratoLaunch’s carrier aircraft. No launch contracts have yet been announced. The CYGNSS launch was Orbital ATK’s second of 2016, following a successful return-to-flight for its larger, liquid-fuelled Antares rocket in October. 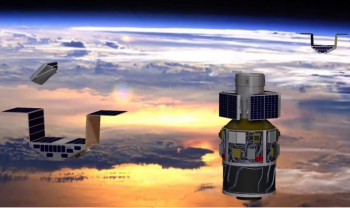 Orbital’s next launch is currently scheduled for January, when a Minotaur-C rocket will deploy six earth imaging satellites for SkyBox Imaging and a cluster of other small satellites. Formerly known as Taurus, the Minotaur-C is a ground-launched version of Pegasus with a large solid rocket motor – either a Castor 120 or the first stage of a retired Peacekeeper missile depending on configuration – replacing the carrier aircraft. January’s launch will be the rocket’s first flight since back-to-back failures in February 2009 and March 2011, both of which were lost due to the rockets’ payload fairings failing to separate. Also in 2017, Orbital are expected to make the first launch from Cape Canaveral of their Minotaur IV rocket, orbiting a satellite for the US Air Force’s Operationally Responsive Space office. Two Antares launches with Cygnus spacecraft to resupply the International Space Station are planned for June and November, while a third Cygnus will be launched in March atop United Launch Alliance’s Atlas V rocket. (Images via NASA, Orbital ATK and Stratolaunch).